June 10: Our plane landed in Tokyo and we ate food and went to bed around 9:30. June 11: Cari, Rachael, her kids, and I went to Joyopolis, which was like a Dave & Buster's place, because the museums we initially were thinking were closed, it was very rainy. We ate awesome donuts in the subway, very Japanese style. Later that night, we went to sushi with Dan and his son. June 12: Cari and I took the eldest son to the Meiji Jingu shrine. Later, Dan took us to Akihabara, which is like he center of Tokyo's geek culture. June 13: We wanted a slower/rest day before Disney tomorrow, so we did more close-range stuff. Rachael and her kids took us to an amazing restaurant where you order through a vending machine. We accidentally ordered 2 beers which we meant to order chicken, but the beers were really fantastic so it was a happy accident. June 14: Disney Sea! A Disney park only in Japan! It was literally the perfect Disney day. Cloud cover enough to keep it cool but still be bright, parking right up front, first in line to go into the park, no waiting in hardly any lines for any ride (except Tower of Terror), and we won a ticket lottery for a special show and got seats in the front! A wonderful day! June 15: We went swimming and hot tubbing at a hotel. Very relaxing after a Disney day. 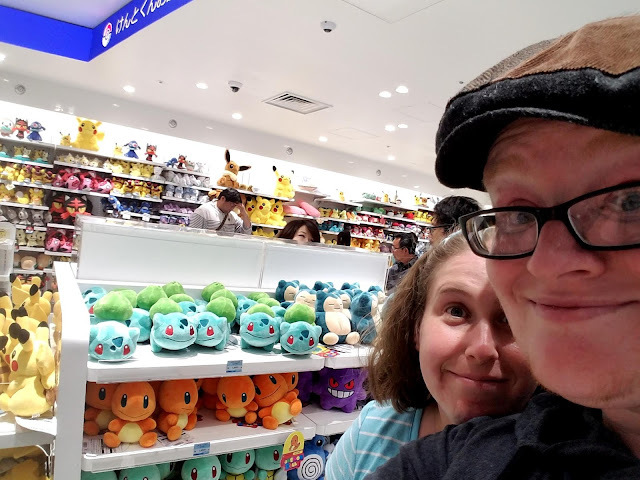 Cari and I did a solo walking tour of Shibuya, eating a bunch of random things. 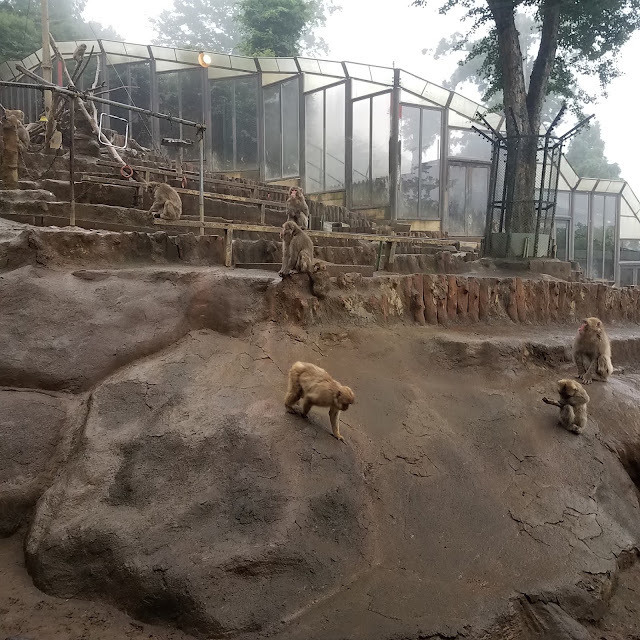 June 16: The whole family went with us to Mount Takao. A mist covered the mountain as we climbed, vanished as we descended. We reached the top and rang a bell at a shrine. Saw real monks. Also, we got to feed monkeys. Truly a special day, one of my favorites. June 17: Rachael was an amazing planner, and did a tour for us of a beautiful city garden, followed by a boat tour down the river, and then ending at the Skytree. We did some shopping and the mall got evacuated for a fire, haha! Saw the Pokemon Center. June 18: Rachael and her kids took us to an arcade and then to Karaoke. I played Mario Kart with her kids and more claw machines. We sang a bunch of Disney songs after. 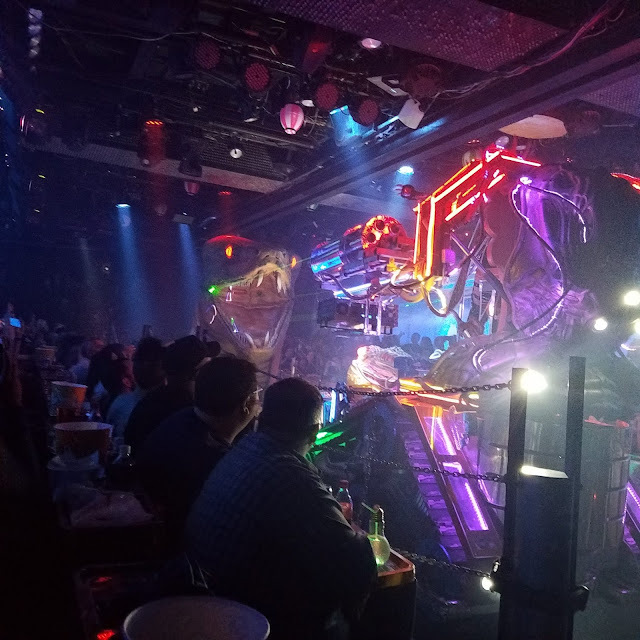 Later, the adults went to the Robot Show in Shinjuku. It was really ridiculous and amazing. June 19: Cari and I took one last solo trip through Shibuya and ate lunch at a noodle place. Then we did a 12 hour flight back to Cananda, 2 hours to STL. The flight home was better but left us jetlagged. Cari's folks picked us up and took us to Denny's. Whew! Truly, this was an amazing trip, one we'll never forget! Thanks to Rachael and Dan and their kids for hosting us and making this special!